Prime Minister Binyamin Netanyahu told Arab viewers in an interview on the pan-Arab Arabic-language Al-Arabiya satellite network Wednesday that Israel is still willing to negotiate with the Palestinian Authority. The PA walked away from the negotiating table when Netanyahu entered office in 2009. Since that time, PA Chairman and Fatah leader Mahmoud Abbas has insisted he will not negotiate with Israel as long as any form of construction continues on land the PA has decided it wants for its hoped-for country. This includes things as simple as building a roof over the front steps of an existing home in a 30-year-old Judea or Samaria town, or adding on a room to a house or building a kindergarten in a 40-year-old Jerusalem neighborhood. Instead of resuming negotiations, the PA has turned to the United Nations, and plans to submit in September a request for recognition as a new sovereign nation. The entity also plans to request membership in the international body. Although the former bid may succeed, inasmuch as the U.N. General Assembly can pass a resolution of "recognition" without requiring approval from the U.N. Security Council, a bid for membership is another matter: such a request does require Council approval through a unanimous vote by its five permanent members. The United States -- one of the five -- has already said it would veto such a move. Netanyahu told the interviewer that Israel has always been willing to sit down for talks with PA leaders – but PA Chairman and Fatah leader Mahmoud Abbas has refused to negotiate with Netanyahu for years, with the grudging exception of three "photo op" meetings a few weeks before a 10-month moratorium on Jewish building in Judea and Samaria ended in September 2010. But the prime minister added that it is impossible to reach peace with a group that does not recognize Israel's right to exist – the Hamas rulers of Gaza – which earlier this year joined the PA government in a reconciliation deal with the rival Fatah faction. 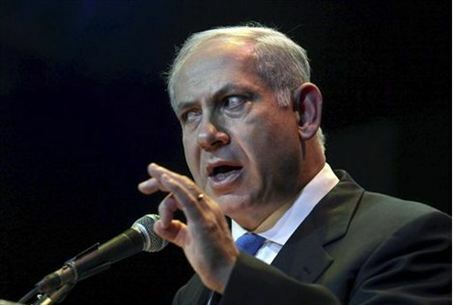 “If people say no, the state of Israel shouldn't exist, it should be wiped off the face of the earth, the way Iran or Hizbullah or Hamas say, there's not much place to go,” Netanyahu pointed out.